Regional Universities Forum for Capacity Building in Agriculture (RUFORUM) has received a grant ($1,505,350) from Carnegie Cooperation of New York to support a project entitled Training the Next Generation of PhD Graduates in African Universities. This is a two year project (October, 2015 – September, 2017) aiming to enhance the knowledge and skills of the teaching staff, in particular women faculty, and thereby facilitate emergence of competitive postgraduate programs in Africa. This project will help to upgrade qualifications of university faculties in Africa, while ensuring quality of graduates, and relevance of research, with particular emphasis on women. 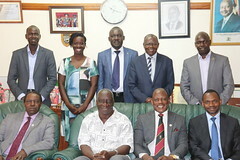 It will also help to make graduate students confident, life-long learners creative and able to take the initiative and adapt their learning to the local situation and facilitate greater Intra African exchanges of faculty and students in order to encourage networking and increase diversity of experience in teaching and research. In order to achieve these objectives, the project will provide; 75 fellowships for RUFORUM sponsored students who have completed coursework and field research to finalize theses and disseminate findings; short courses and further specialized training for students, bringing the students together across countries; students fellows to attend international conferences; fellowships to support mobility of faculty to draw on best African expertise to teach on RUFORUM Regional PhD programs outside their home countries. RUFORUM is a consortium of 46 member universities and has been facilitating innovative and responsive post-graduate degree programs and research since 2004. It promotes high performing, proactive graduates, a dynamic platform for university networking, and carries out advocacy for agricultural higher education.